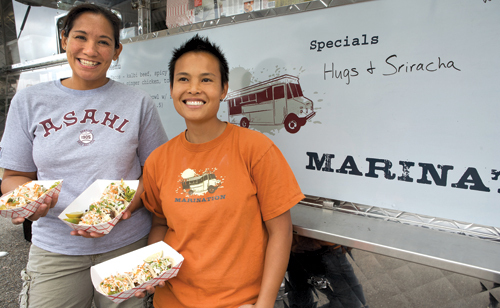 We’ve long been fans of Roz Edison and Kamala Saxton’s Korean-Hawaiian truck, Marination Mobile. Now comes news that Edison and Saxton are setting up a stationary shop in which to sling their vittles, tentatively called Marination Station. It’s scheduled to open in early April in the Harvard Market, on the Harvard Avenue side of the building housing QFC and Bartell Drugs at Pike and Broadway. Saxton says the space was irresistible not only for its locale in the heart of the Pike-Pine corridor, but also for the 200 free parking spaces (a serious rarity on the Hill), which will make it a no-brainer for diners to drop by for lunch and dinner. Along with a menu of their greatest hits—kimchi quesadillas, Spam sliders and the like—the ladies are working on a few new menu items they’re not quite ready to divulge. One definite addition to the offerings: a selection of beer and wine.